Siberian cats are pure breeds that are said to have originated in Russia centuries ago. They have long hair, broad heads, rounded ears that angle outwards, plumed tails and large slanted eyes. These cats are widely known for their furs and proportioned bodies. To help you name your new Siberian kitten, here are some of the most popular names for this wonderful breed of cats. This Siberian cat name originates in Ireland, and it symbolizes a sea warrior. Nikolai is a Russian name that means “people of victory”. Joseph is a Hebrew name that means, “God will increase”. This is an Italian name that signifies a famous fighter. Keanu is Hawaiian, and it means “cool breeze over the mountains”. This Siberian cat name denotes the large, striped and carnivorous mammal from Asia. 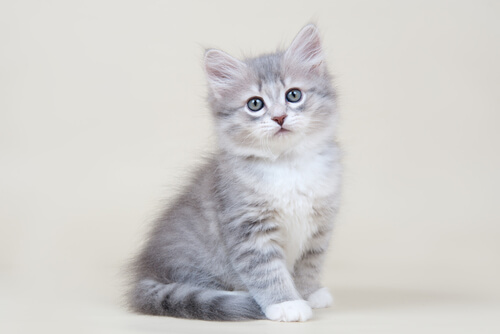 As the name suggests, this Siberian cat name means having good luck. This name sounds a natural, because Caesar is a Latin title of the Roman emperors. By calling your male Siberian cat Duke, you would be branding him as the highest ranking nobleman. This is a Hebrew name that means helper or salvation. Gideon is a Hebrew name that means the mighty warrior, the destroyer or the brave spirit. This Slavic name simply means a battler or a fighter. Just as the name suggests, a hunter is one who searches for something. The origin of Flurry is Irish, and it means King or Prince. Kevin is Irish, and it means one who is handsome. This male name refers to one who is dispatched to collect information. For the frisky and curious. A Swahili name that stands for the lion. Zeus is a Greek name symbolizing the father of the Gods. This name originated from Russian, and it signifies the unconquered. Asha is a Hindi female name that denotes life or hope. ‘Bubbles’ is an English name that means liquid filled with gas or air. For the fluffy kitties out there. The origin of this female name is Norse, and it means an “eternal ruler”. Cameo is a French word meaning a carved piece of jewelry. This Greek name means a royal child. A Latin name that means strong and healthy. This name is believed to be either French or Germanic, and it means a free man. If you believe that your Siberian female cat is virtuous, then this name suits her because it means pure. Eden is a Hebrew name that refers to a paradise of delights. These two are Greek, and they both mean a bright light or torch. A Greek name that denotes kindness. This female cat name is given to speedy little cats. It means to move quickly. This is an Italian name that means beautiful. This name comes from the colorless liquor distilled from grains. Chloe is Greek, and it means flowering. Lena signifies light, alluring or temptress. Originating from France, this name denotes a cracker or a cookie. 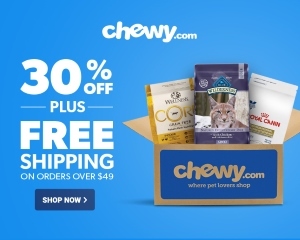 For those kitties that are so sweet, you just want to bite them! Clover is a distinctively smelling spice. Gypsy is an English word that refers to a wanderer. A female name that implies noblity. A Slavic female name that means bright. A Japanese female name that means intelligent. An English male name for the bold and courageous kitties. A Greek male name that means brave. A Greek male name signifying pride. A French unisex name that implies calmness. A Latin male name that means lucky. A Hindu unisex name that means loving. An English male that denotes a helpful character. A male name for a cat with a bulky body and coarse, thick fur. A female name for a very small sized or petite cat. An English male name for a dark-furred cat. An English female name for a white, shadowy-furred cat. A Russian female name for a large brown-furred cat. An English male name for an intensely dark-furred cat. A Latin female name for a cat that was previously dark-furred but suddenly lightens up its appearance. A male name for a cat with multiple colored spots. A unisex name for a fluffy cat. A Latin male name for a red-haired cat. An English male name for a teamster. A Latin female name for a star. A Russian female name for holy. A Hebrew male name that means to tremble. A Russian male name for cute. A Japanese female name for a beloved. A Spanish female name that means very small or tiny. A Swahili male name for a lion. A Unisex name that means lively. An English female name for a princess. 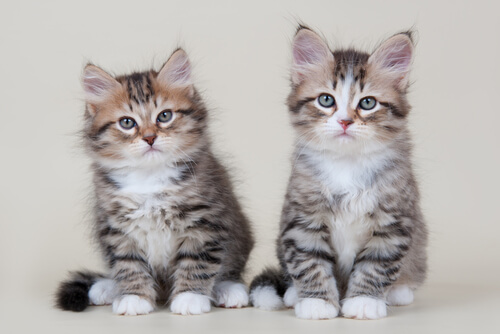 Do you think we left out other popular Siberian cat names? Be sure to tell us all about it in the comments section. My name is Lucky and although I am not a Siberian cat, I’m pleased that I made the list of names. I was found abandoned outside at just 6 days old and I am really lucky that the local fox didn’t get me before I was found. Sasha and Aleksei are good Russian cat names. We just adopted a cat from the Cochrane Humane Society in Alberta. Her name is Perelka. We looked her name up and it is the name of a village on the Polish/ Ukraine border, meaning Gem. We searched cat breeds and discovered she is a Siberian grey. Large cat, large paws, intelligent, agile and strong- matches the photos of greys on the internet perfectly. Sheds alot as expected for a long hair. Gets along fine with our dog after about two days of sniffing.